The arc welding consists in using the phenomenon called arc, which is formed by electricity, turning it into heat to weld metals. Covered Electrode (wire) It has good flexibility and can weld most of the metals in a wide range of thicknesses. 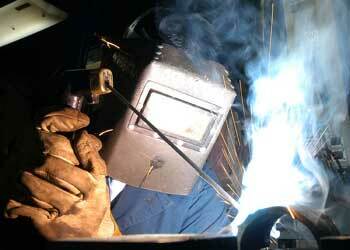 In this process, the welding can be done in almost all places and under extreme conditions. Welding with covered electrode is extensively used in industrial production, buildings, ships, cars, trucks, floodgates and many others. Semi-automatic MIG (Metal Inert Gas) It utilizes inert gases, which are Ar (Argon), He (Helium), etc. MAG (Metal Active Gas) It utilizes active gases, which are CO2, mixtures of Argon/CO2, Argon/O2, etc. Electro gas The electro gas welding is a variation of MIG/MAG processes with a tubular wire (flux cored wire), which uses copper cooling shoes to confine the weld puddle (pool) for vertical position welding. Tig(Tungsten Inert Gas) The most utilized gas in TIG welding is the Argon, which is an inert gas. The TIG welding is a process quite adequate to thin thicknesses due to its excellent control of the weld puddle (electric arc). TIG welding enables to weld aluminum, magnesium, titanium, copper and stainless steel, as well as metals hard to weld and others relatively easy to weld, such as carbon steels. Submerge Arc (SAW) The arc is submerged and covered by a layer of fusible granular material called flux. A use of the process of submerged arc welding is the welding of thick plates of steel, for example, pressure vessels, tanks, large diameter pipes and girders. This type of welding has been applied widely in Japan, mainly in naval industries. Plasma It is divided into Plasma Arc and Plasma Jet. Initially, in the 50’s decade, the plasma was used to cut materials that couldn’t be cut by oxycutting process, such as stainless steel, aluminum and copper. The greatest advantage of the plasma is the cutting speed to cut thin metallic plates, when compared to the oxycutting. Gases usually utilized for plasma cutting are Argon, Hydrogen, Nitrogen and Oxygen, as well as the mixture of these gases.